Following your agreement on a product return, you should receive a package from the customer. Once you have received that package, you must create a credit slip from the order’s page. It can also be called “credit note” or “credit memo”. Credit slips are not created in the “Credit Slips” page but only listed there. This page is also used to generate a PDF of your credit slips. Credit slip prefix. You might like to have language-tagged delivery slips. Of course, you can also choose to not have a prefix at all. Your catalog will then generate the credit slips number according to your settings. 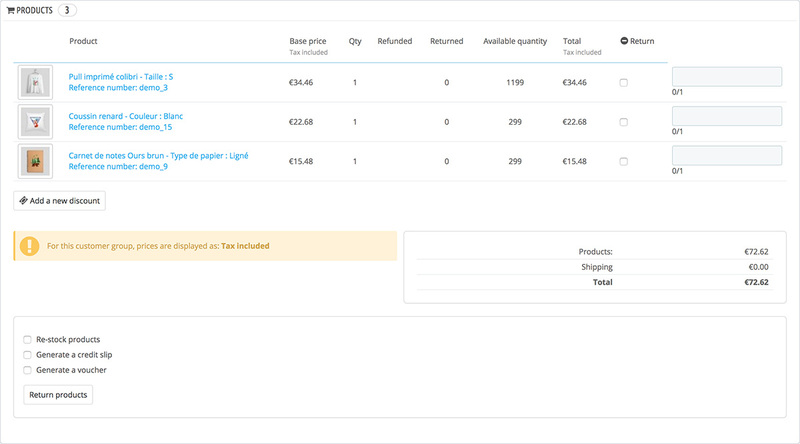 In your list of orders (“Orders” page), click on the order for which the customer is returning some items for more details – this will only work if have already indicated that the customer can send products back. The credit slip is now created and will be available in the Order Details well as in the “Credit Slips” page. From there, you can click the link to download the PDF file. The customer will see the slip in his or her “Account” section. The amount of the returned item(s) is added to the voucher. The customer can use the discount code (listed in the far left of the column) next time he or she places an order.